HOW DO WE USE THE LAND USE TOOLKIT? The Implementation Handbook is the user’s manual and step-by-step guide to the Louisiana Land Use Toolkit. The Handbook serves as the instruction manual for converting the Toolkit into a customized zoning code, subdivision code or development code that meets the specific needs of your community. The Handbook identifies what you need to get started and provides an idea of what to expect as you move through the process. The Handbook is the starting point and should be consulted before beginning the implementation process. Click on the steps below to learn more about each phase of implementing the Land Use Toolkit. If there is any single document that is essential to a successful Toolkit implementation, it is a comprehensive plan. So what is a comprehensive plan? A comprehensive plan documents a shared community vision and establishes principles for how the community might grow and develop over time. A comprehensive plan serves as the guide for decisions made by the city, town or parish, including elements such as economic development, growth management, schools and public facilities, streets and infrastructure, parks and open space, and future land use. Developing a shared community vision and guiding principles is typically the first step in the comprehensive planning process. A shared community vision is used to guide the difficult decisions that must be made when implementing various aspects of the Toolkit. Learn more about developing a shared vision. One of the most important and difficult decisions a community can make is where and how they grow. If a community decides to build a road, open a new school, or extend urban services to an area, it will almost certainly generate growth in that area. These activities must be coordinated with land use and facility planning and the comprehensive plan is the place to do this. Learn more about developing a growth management strategy. A future land use map portrays the community vision and projects how the community should develop over the planning horizon. This map doesn't necessarily reflect the current land use, but rather how land uses might change over time. Learn more about preparing a future land use map. Before beginning the Toolkit implementation process, it is important to identify current regulatory barriers to implementing the comprehensive plan. 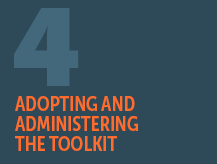 The analysis should identify both barriers to applying the Toolkit as well as tools needed to aid with implementation. Learn more about identifying barriers to plan implementation.